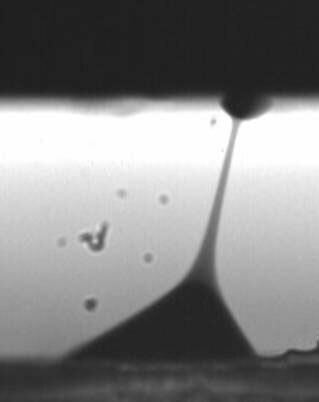 (Nanowerk Spotlight) The ability to extract, dispense and manipulate very small amounts of liquids on the micro- and nanoscale is important in biotechnology, chemistry and also for patterning inorganic, organic and biological inks. Several methods for dispensing liquids exist, but many require complicated electrodes and high-voltage circuits. Researchers in Italy have now demonstrated a pyroelectrohydrodynamic droplet dispenser based on pyroelectric forces. "We developed and demonstrated a completely new method for extracting and dispensing very small amounts of liquid – as small as few attoliters – from liquid droplet reservoirs or thin liquid films by a method called pyroelectrohydrodynamic (Pyro-EHD)," Pietro Ferraro tells Nanowerk. "Furthermore, the method allows a varieties of smart functionality for droplets manipulation and liquid transfer establishing a new approach for manipulate liquid in 3D. In fact we have discovered a simple but reliable way to transfer of liquids between two substrates demonstrating liquid printing with nano-pico droplets allowing patterning with any geometry over lengths of centimeters." Ferraro, director of the Research Unit/Labs at the National Institute for Applied Optics (INOA) in Naples, Italy, and his team (S. Coppola, S. Grilli, M. Paturzo and V. Vespini) devised a system that offers several advantages over conventional electrohydrodynamic (EHD) systems. Their findings are presented in a paper in the May 9, 2010 online edition of Nature Nanotechnology ("Dispensing nano–pico droplets and liquid patterning by pyroelectrodynamic shooting"). Until now, essentially two approaches existed to transfer small amount of liquids for dispensing and printing: Standard EHD that requires a nano-nozzle and high voltage (KiloVolts) to be applied between the dispensing nozzle and the substrate to pattern, fabrication of electrodes, etc. One of the drawbacks here is that not all liquids can flow through nano-nozzles limiting the typos of liquids that can be dispensed. The second approach is nanolithography based on dip pen writing that makes use of scanning probes (like AFM) but that are slow and that can print only small areas. "Our system does not require electrodes, high-voltage circuit connections or special capillary nozzles and no sample pre-treatments are therefore required" explains Ferraro. "The system is easy to use and non-invasive, and is therefore potentially useful as a portable instrument for in situ drawing and delivering of liquid samples within a chip. Furthermore, because it does not require nozzles, issues of cross-contamination can be avoided." 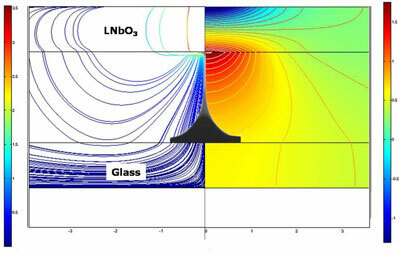 In this system, the electric fields are generated pyroelectrically using functionalized substrates of lithium niobate. The dispensing system consists of two plates and a heat source. The heat source could be a non-contact infrared beam or a hot tip of a conventional soldering iron, acting as a contact stimulus. A microscope glass slide forms the base of the liquid reservoir (which could be a drop or a film), and the lithium niobate crystal wafer acts as an auxiliary plate that drives the process and acts as a substrate for the dispensed liquids. A point wise thermal stimulus is applied to the lithium niobate crystal to induce the pyroelectric effect locally. Ferraro explains that the pyroelectric effect has been used recently for wettability patterning, particle trapping and liquid microlenses. "Here, we use this effect to transfer liquids between two substrates and manipulate the droplets three-dimensionally. The simplicity of the technique suggests potential uses in a range of liquid manipulation fields, such as generating and dispensing daughter droplets, fragmenting microliter drops, and liquid printing. We expect the technique to have many applications in biochemistry and nano-printing." The pyroelectrohydrodynamic ‘dispensing gun’ may operate with various functionalities. For example, the shooting direction can be changed within a wide solid angle by moving the thermal source (hot tip or laser beam). The shooting function can also be synchronized harmonically with the displacement of the droplets while they are dispensed continuously. "It is important to point out that the technique is able to print droplets with much reduced dimensions by decreasing the volume of the drop reservoir – for example, after a certain number of shots," says Ferraro. The possibility of simultaneous shooting adjacent drop reservoirs would enable high-throughput biochemical assays, and the development of integrated platforms for parallelized reactors and compartments for spatially separated processes. The ‘sliding droplet’ function can easily mix and transport tiny droplets rapidly, and the ability to print attoliter droplets may be useful for single-cell analysis. The major differences with the Italian team's method is that they can dispense and pattern even high viscosity polymers (i.e. PDMS) in that it is a non-contact method since the dispensed liquids do not experience contact with other materials. This avoids the problem of cross-contamination that exists with other methods. Going forward, the INOA team will focus their research on integrating their system on lab-on-a-chip devices with the aim of implementing various functionalities. "In fact" says Simonetta Grilli, a leading researcher of the team, "the revolutionary feature of the pyroelectrohydrodynamic dispenser would be to avoid the use of the drawing and delivery instruments traditionally used in biochemical protocols – that is, syringes and nozzles – thus making the assay procedures much easier and faster. In fact, the pyroelectrohydrodynamic dispenser could be used as a tool for breaking up parent drops that are standing on a surface into daughter droplets to be delivered directly to the desired substrate, where the droplets could be used as reaction confinements for biochemical assays and also for single-cell analysis."